Issued in a foldout Digibook, with 12-page affixed booklet. Recorded in 1971 at Headley Grange, Hampshire, with The Rolling Stones Mobile Studio. Released as a single (Atlantic 2849) on 12/2/71; #15 U.S. pop. Mixed at Island Studios and Olympic Studios. Released as a single (Atlantic 2865) on 2/21/72; #47 U.S. pop. Recorded in 1971 at Island Studios, London. Mixed at Island Studios, London. Released as the B-side of "Black Dog" (Atlantic 2849) on 12/2/71. Released as B-side of "Rock And Roll" (Atlantic 2865) on 2/21/72. Mixed at Sunset Sounds, Los Angeles. Originally released as Atlantic 7208 on November 8, 1971. "Stairway To Heaven" Lyrics © 1971 Superhype Publishing, Inc.
All rights administered by WB Music Corp., ASCAP. Digitally remastered from the original master tapes [...] at Sterling Sound. © 1971 Atlantic Recording Corporation for the United States and WEA International Inc. for the world outside of the United States. All Rights Reserved. ℗ 1994 Atlantic Recording Corporation for the United States and WEA International Inc. for the world outside of the United States. Made in Germany by Warner Music Manufacturing Europe. 1st catalog# from spine, booklet and back cover. 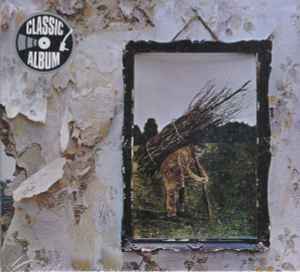 This release is commonly referred to as 'Led Zeppelin IV', to follow in sequence with their previous three releases, but no actual title appears on the release.